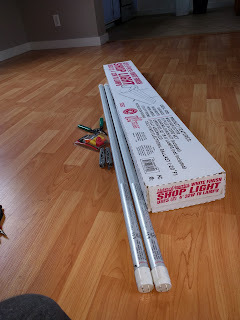 NO6E.ORG: Pre-Retrofit A Florescent "Shop Light"
One of the most useful and inexpensive light sources is the "Shop Light." Originally, they held two (or sometimes four) 4 foot florescent tubes rated at 40W each. More recently, most come with "Energy Saving" 32W tubes. 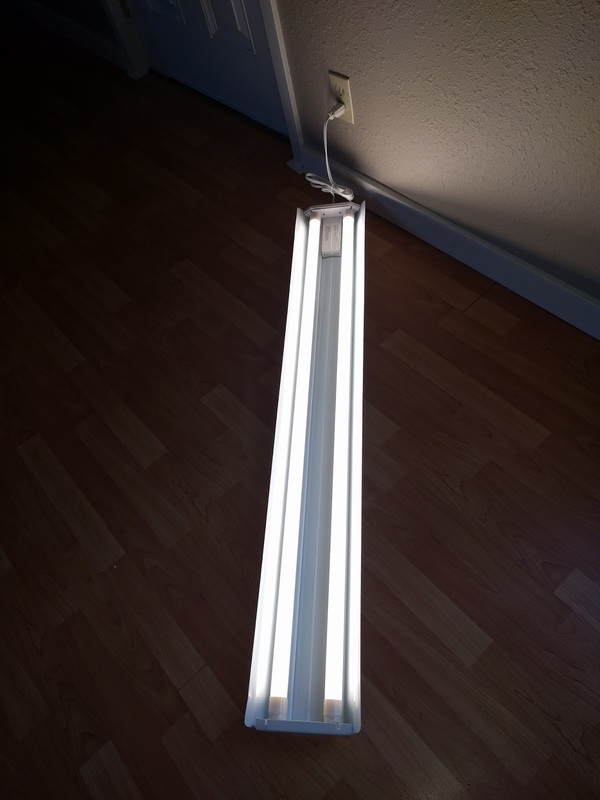 While LED shop lights are becoming available, they are more expensive, and it's easy to repurpose a fixture intended for florescent tubes to use LED tubes instead. 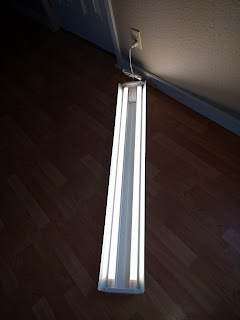 This shop light fixture, sold without tubes, costs less than $11. Shown with it are two four foot LED replacement tubes, which cost me $9.95 each from Amazon. That's not cheap, but they don't contain mercury like florescent tubes do, and one can select the color temperature one wants. There are four temperatures available, from "warm white" (4000 Kelvin) to "arctic white" (6000 Kelvin). Choose the color you like best. 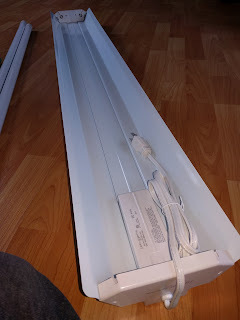 Most home florescent tubes and fixtures have two pins at each end. 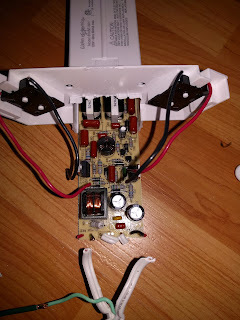 When doing a conversion, I prefer the "single-ended" replacements, where 117 volt power is connected to the two pins at one end of the tube and the two at the other end connect to nothing. "Double-ended" tubes are wired differently. This article assumes single-ended tubes are being used. The tubes here are made by Hyperikon, part number 842100608. I bought them from Amazon. They use 18 watts per tube, about half what florescent tubes would use. 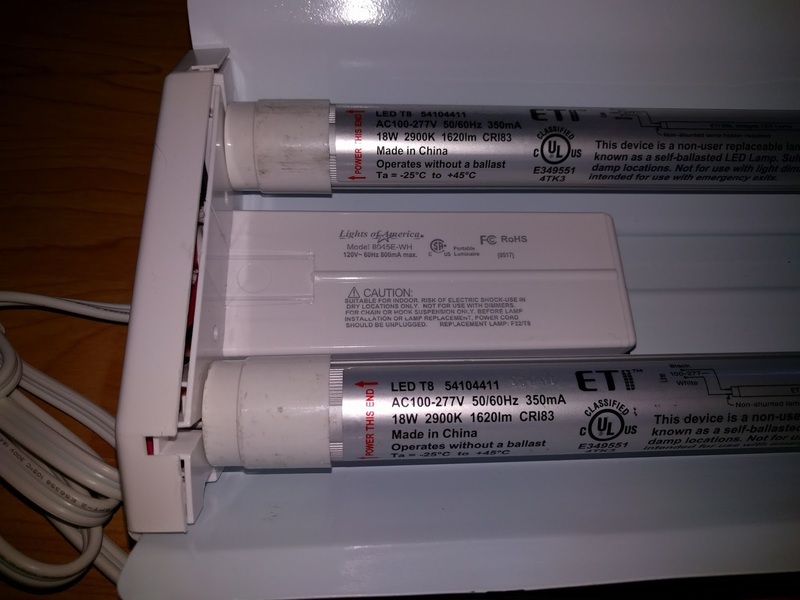 Florescent tubes need a "Ballast," either magnetic or electronic, to control current. LED tubes do not, and it's best to remove the ballasts from fixtures that will use them. The fixture I used is by "Lights of America," part number 8045 E-WH. I bought it at WalMart. 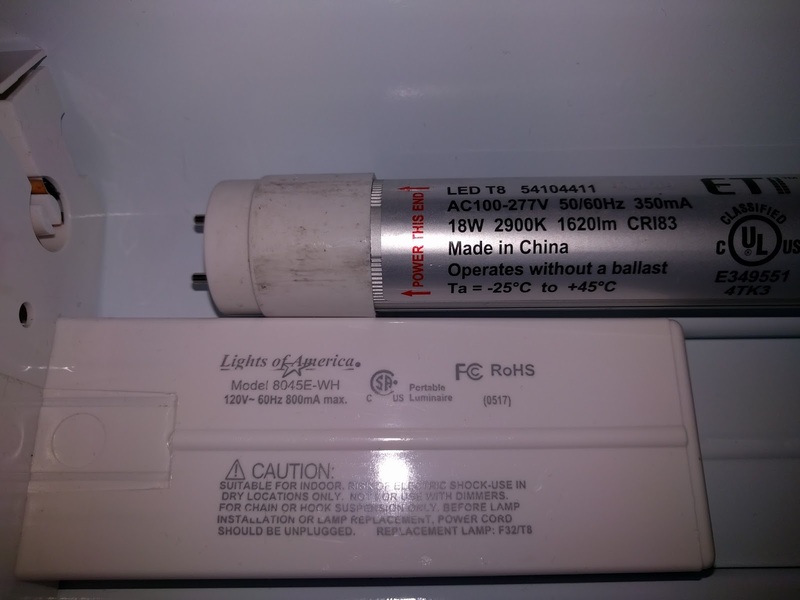 It uses an electronic ballast in the plastic container shown in the picture. 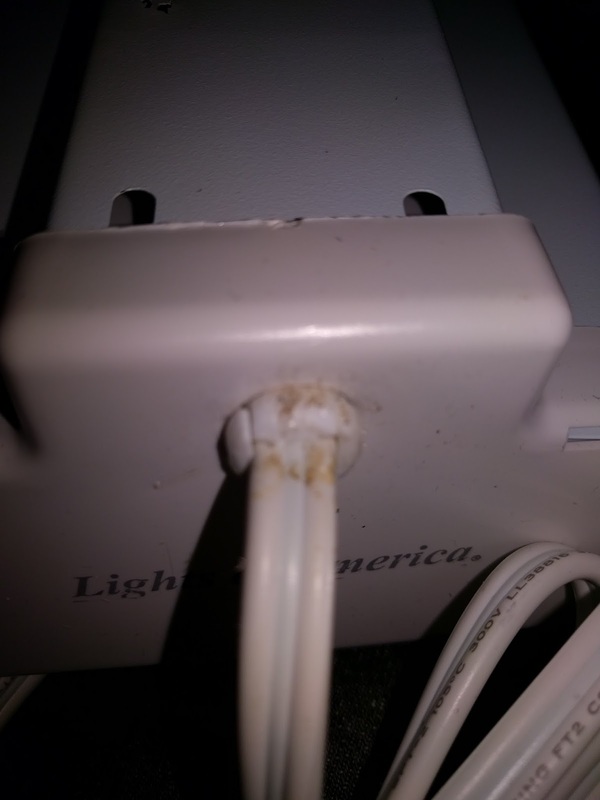 To begin the modification, be certain that the AC cord on the fixture is NOT plugged into a power source. Gently pry out the center cover, which hides wires. We're going to remove the wires, so the cover can be replaced afterwards or not. 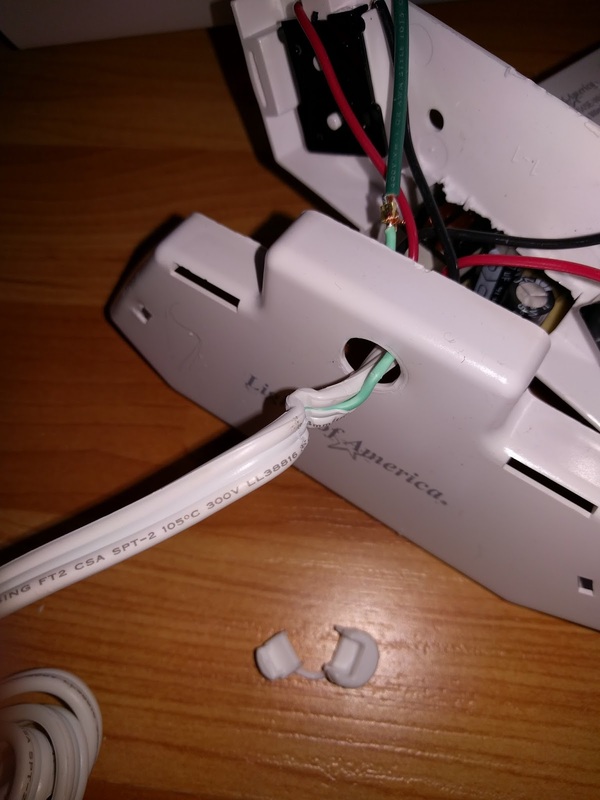 Before disassembling the end pieces of the fixture, remove the plastic "strain relief," which ensures that force applied to the cord is transmitted to the fixture body, not to the wire connections inside it. Look closely at the plastic strain relief. It's in two pieces, with a plastic strip linking them. 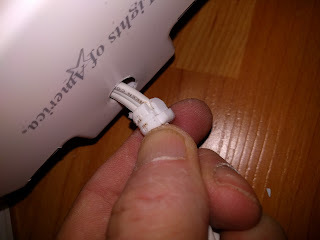 Remove it from the fixture by squeezing the two parts together using pliers, then pulling it out of the mounting hole. Since it's designed to hold the cord firmly, some serious squeezing may be needed. Once you have it out, gently pull the two parts open, freeing the cord. Unclip the end of the fixture without the power cord from the metal reflector. Remove the cover from the part with the lamp contacts by pressing two tabs holding them together apart. Once you have the end removed and separated, cut the wires very short against the sockets, since they will not be used after modification. Then reassemble the end piece and snap it back onto the reflector. Now disassemble the fixture end piece from the end WITH the AC cable. Note that there is a green ground wire that attaches to the reflector under the ballast. Pull the free end of it out of the tab on the reflector to which it attaches. 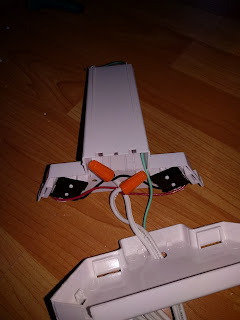 Cut the wires that went to the far end of the fixture where they go into the plastic box that houses the ballast. 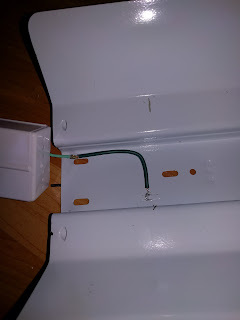 Remove the end piece and slide the circuit board of the ballast out of its housing. Now cut all the remaining wires going to the circuit board as close to the board as possible. Discard the circuit board. Separate the AC cord by two inches or so to provide more length for the ground wire. Each tube socket has two wires. 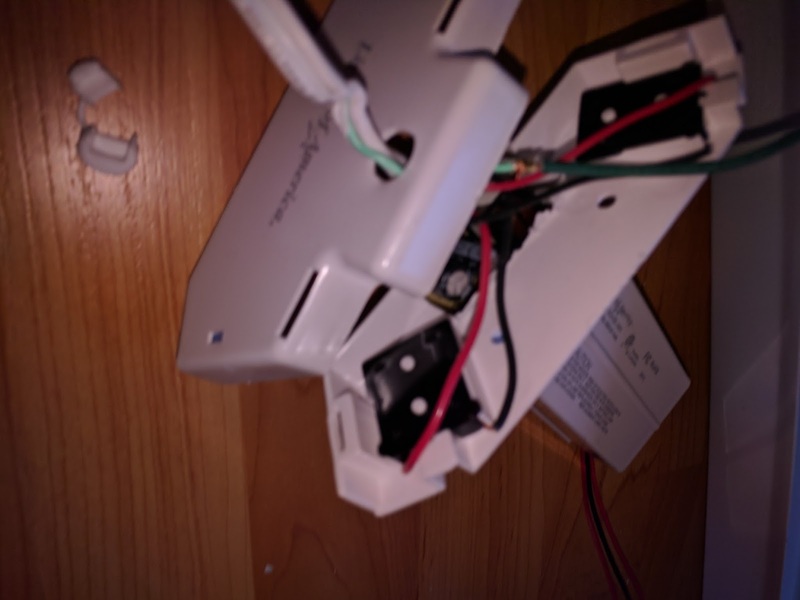 We will connect one wire from each socket to each of the two white wires in the AC cord (it doesn't matter which. Strip about 1/2" of insulation from the four wires attached to the sockets and the two white wires from the AC cord. Leave the green wire alone. To make the connections, hold the three wires (one from each socket and one of the two AC wires parallel. 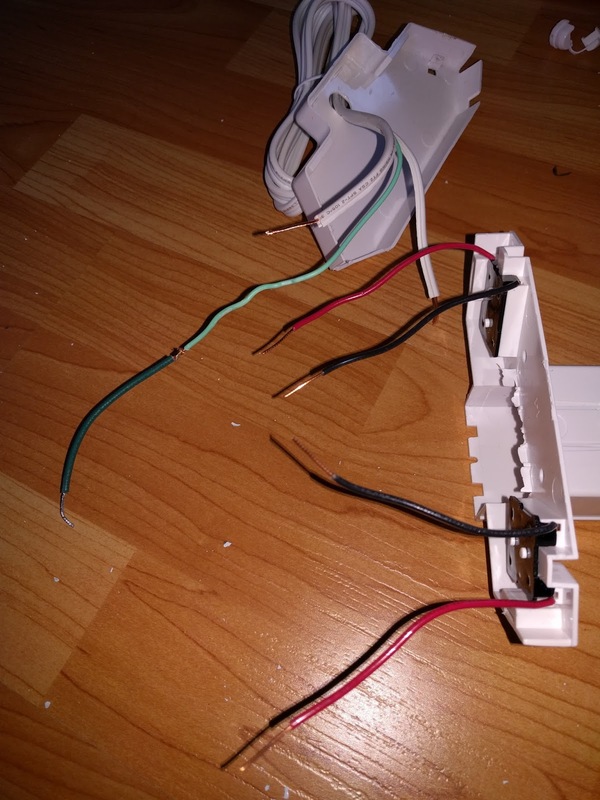 Twist the two connections together with a "wire nut" by screwing it onto the three wires so it twists the wires together. Continue twisting the wire nut until the wires protruding from are twisted together beyond the nut Itself. Be sure the uninsulated copper wire does not protrude from the wire nut. Redo it if necessary. 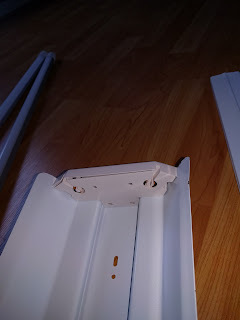 Reassemble the two plastic sections of the end piece. was originally attached. Snap the end piece onto the reflector, sliding the now-empty ballast enclosure into place as you do. 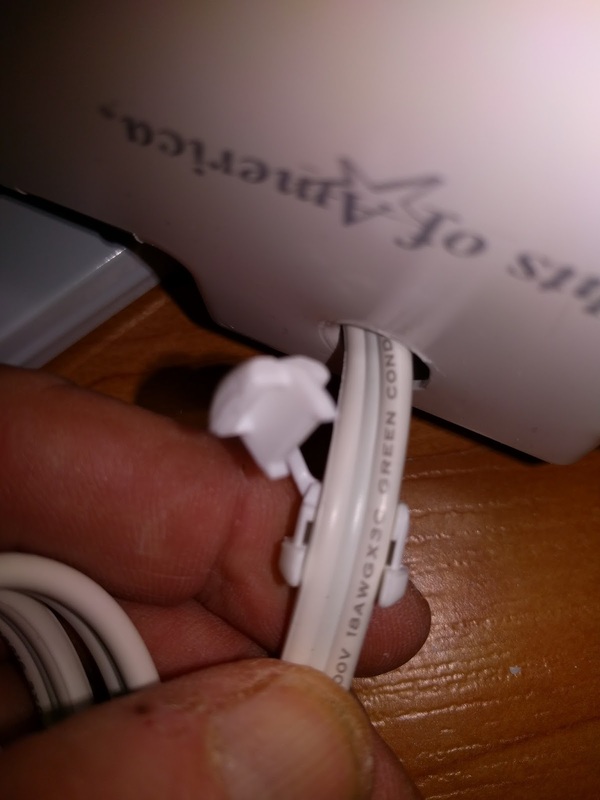 Put the AC cord through the strain relief as shown, with the smaller end facing the fixture. Then close the top part of it and squeeze it together. Since it holds the cord tightly, some muscle may be needed. Once you've squeezed the two halves of the strain relief together, push it back into the hole in the plastic end piece until it snaps in. Again, some muscle may be needed here. Now insert the new LED tubes. Be sure you have the "POWER THIS END" label on the tube at the end of the fixture with the AC cord. Line up the two pins on the tube so it slides into the circular socket. Be sure the other end of the tube is in the socket as well. 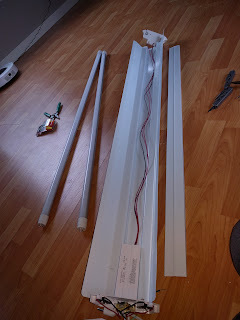 Then rotate the tube until the side from which the light comes faces out of the fixture. Though not shown here, I wrote a note in Sharpie on the ballast housing saying that the fixture should be used only with LED tubes. It's not likely to matter, though, since the LED's have extremely long lifetimes. Check both tubes to see that they're in the sockets at both ends and plug the fixture AC cord into an outlet. The tubes should light up. 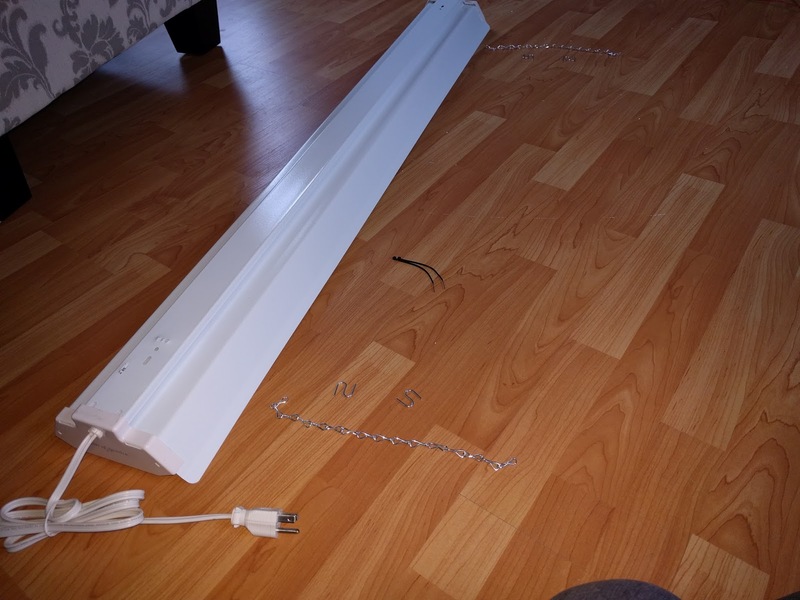 This fixture came with two short chains and four "S-hooks." Use them to suspend the fixture. Substitute longer chains if you need them. After hooking the S-hooks into the fixture and the chain, bend the ends of the hook together so they will stay attached.